More than 650 educators from schools in the NESA region (and beyond!) 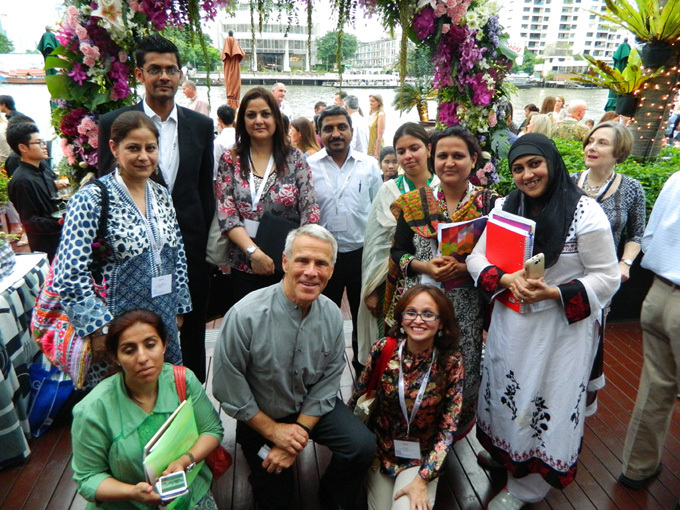 gathered April 4-7 at one of NESA’s favorite venues: The Royal Orchid Sheraton in Bangkok, Thailand. Delegates attended four keynotes, three half-day specialist sessions, and four teacher-produced workshops (from a choice of 45! ), plus a session of General Interest Workshops presented by NESA members and affiliates. The four cutting-edge keynoters spoke about timely issues: Heidi Hayes Jacobs (sponsored by International Schools Services) author of the series,Contemporary Perspectives on the New Literacies: Digital-Media-Global, shared her new model on how to “reboot traditional print literacy” in “Leading the New Literacies: Digital-Media-Global”; Kathy Collins, author of Reading for Real: Teach Children to Read With Power, Intention, and Joy in K-3 Classrooms,discussed “enduring truths” educators can hold onto in the face of constant change, in “In Search of Significance In Times When Everything is High Priority”; Karen Boyes, an Affiliate Director of the International Institute for the Habits of Mind, spoke on “Developing Independent, Self-Directed Thinkers” via five important ‘keys for teaching’; and Alec Couros (sponsored by Buffalo State-SUNY), from the University of Regina, Canada, closed the conference with “Identity, Networks, and Connected Learning”, outlining our new technological reality where learning can take place anywhere, anytime, and with anyone. Bob Garmston and Carolyn McKanders led their famous and sold-out “Five-Day Adaptive Schools Certificate Program”, plus several three-day mini-institutes took place: Erma Anderson and Alan Phan with “AERO/Common Core Plus” (Mathematics); and Kathy Collins (Grades K-2), Emily DeLiddo (Grades 3-5) and Carla Espana (Grades 6-8) with “The Literacy Project: Foundation Course in Reading”. Additionally, Rick Detwiler facilitated a two-day strand for Administrative Assistants. Delegates chose from a wide range of four-hour "specialist” workshops on topics ranging from iPads in the Classroom, service learning, how the brain learns, making sense of data, teaching writing, creativity and technology, project-based learning, instructional coaching, digital citizenship, the Habits of Mind, and ‘flipped’ professional development. Additionally, NESA members and affiliates presented six General Interest Workshops, and NESA educators led 45 workshops for their peers. Several awards were given at Sunday’s plenary: Karen Grace Hassanieh of the American International School of Riyadh, the winner of the Stanley Haas/Luke Hansen Student Award (sponsored by TieCare International), addressed delegates, and Meghna Sarah Thomas from the Walworth Barbour American International School in Tel Aviv, was announced as the winner of one of four $4,000 Margaret Sanders Foundation International Schools Scholarships. NESA Teacher Representatives sold raffle tickets for the annual Community Service Raffle, which benefits community service projects in NESA schools. Over $2,700 was raised! To complement the outstanding professional learning opportunities, SEC also offered events for personal renewal and re-connection. Friday evening’s Welcome Reception took place on the Sheraton’s Sambal Terrace with a view of the Chao Praya River. 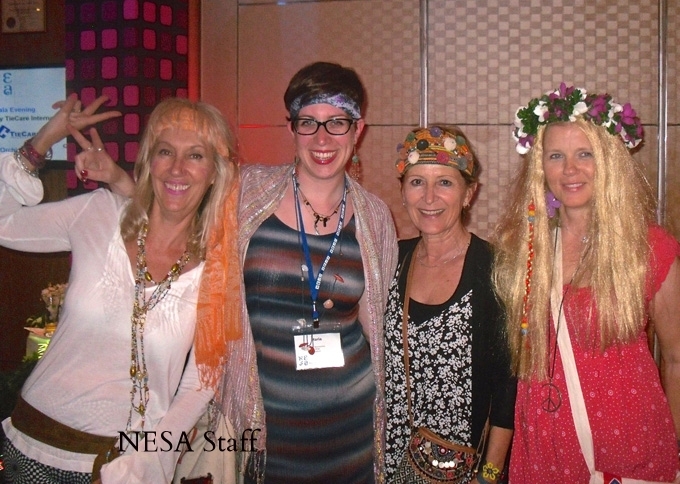 Saturday’s Gala – sponsored by TieCare International – was a first for NESA, with a 1960s theme, optional 60s attire, and great live music by “Beatles. Bangkok”. It was a party to remember!